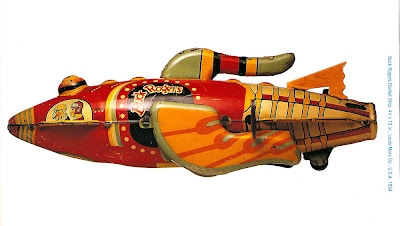 This 1934 Buck Rogers rocket ship toy appears in the book Ray Gun by Eugene W. Metcalf and Frank Maresca. The photography is by Charles Bechtold. I remember Buck Rogers serials at the movies in the late 1940s or early 1950s, where a spaceship very like that slowly trudged out of a moon crater, a shower of sparks falling (not spurting, but falling in a shower) out of its rear end. Looked like it had a railroad flare stuck in its tail. Even at that age I couldn't figure out how that kind of engine made it fly! My mother used to read all her brother's Buck Rogers books in the '30s. Apparently Buck was the Star Wars of its day, a franchise of toys, books, film serials, and Sunday comics by a succession creators. I remember a delightful Sunday comic strip in the '50s, by which time "Buck Rogers" had become a synonym for the paleofuture (Life Magazine, for example, called the '59 Cadillac "the Buck Rogers school of transportation design."